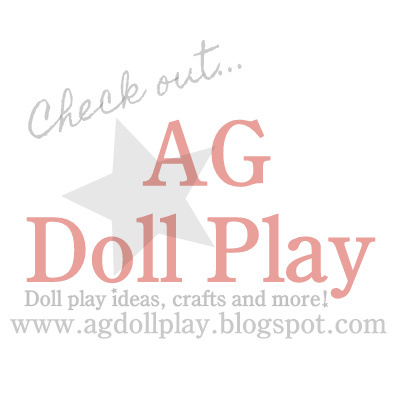 We had so much fun at the doll Valentine's Day crafting party and I wanted to take the time to share what some of the things were that we did while there. We had the girls make some pretend candy for the dolls using seed beads, tacky glue and candy sticks using the tutorial by My Froggy. Amanda had some mini boxes, patterned papers and some fun foam for the girls to make mini valentine mail-boxes for the dolls to exchange their valentines in. Each girl got to decorate their own, this was Zoey's. Each doll had their own table setting which they also got to take home. One of the girls made some sweet little valentine cakes for the dolls. Directions on how to make the table setting can be found here. And then of course each doll got one of Amanda's heart shaped treat boxes which she shared a tutorial on here. The girls decorated some conversation candy hearts using the Brach's Create Your Own kit. Zoe also got a gift of a matching headband and sock set...they matched her dress perfectly don't you think? The tutorial on how to make those is here. And here are some close-up shots...they are so cute! We had a wonderful Valentine's Day and hope that you did as well!